In our Casa, our rooms possess windows, refrigerator, Television, air conditioner, private bathroom with cold and hot water, fan. The housekeeper is very honest and friendly. The food was also amazing. Extremely safe place, which I could only recommend. The warm and friendly elderly Ponce, which is very keen to practice its english. Clean, safe, extremely helpful is Ponce, value for price, good breakfast, no curfews. Location is ok. The home is very clean, Rooms are not that large but it was ok. Ponce is very nice, trying to please visitors - he is very helping. One day we asked him to have for tommorrow`s breakfast, juice of pineapples, and he fullfilled our request. Altogether we spent 7 nights in Casa Tamara - everything was fine. The location is very nice - about 30 mins of walk from Havana Vieja (you follow busy street with lots of food selling points and the biggest shopping center in Cuba) and really near to the Plaza de la Revolucion. Casa Tamara and it`s neighbourhood is peaceful, VERY secure and definitely a nice location to stay. Casa itself is clean (room cleaning everyday). The property owner - Mr Ponce - is a helpful, FAIR (not cheating with the money), english-speaking elderly man. He has REALLY good connections with casa particulares from other Cuban cities (in quite the same prices! ) - and is ready to help you with the reservations. Except that - good breakfasts (4$), clean bath rooms with warm water and nice water pressure. Great casa and good breakfast. 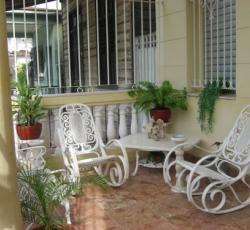 Walking distance to &"Plaza de la Revoluci&on&". The old man in charge of the house is extremely helpful and friendly. Although he doesn&t speak much english, he helped us a lot and gave us useful information. PONCE he&'s really a nice old man. tried his best to help me wiz everything. and the breakfast&'s so great! MILEIDIS no se como se escribe su nombre! ponce cuando ves este msj dile a ella que la extra&no! though the place&'s not that near to the center of the city, it&'s really straightforward to locate a taxi, since the bus terminal is only 2 minutes walk from there. and it&'s situated in a secure neighborhood. Well, the property owner tried his very best to help us out, no matter if it was calling us a taxi or helping us out to uncover a casa particular in other cities, places. * Casa Tamara rated 4.56 out of 5 based on 9 customer reviews. Hostel reviews with a star rating are sourced from HostelBookers. If you find Casa Tamara with the same booking conditions at a lower rate somewhere else on the internet after you have booked, we will refund you the total difference.